Disc degeneration, bulging and protrusions do not sound good, and if they were reported in an investigative image of your low back it would likely be cause for concern. However a recent study is showing that disc bulges and degeneration are just a normal part of ageing, like wrinkles, and are not the cause of pain. 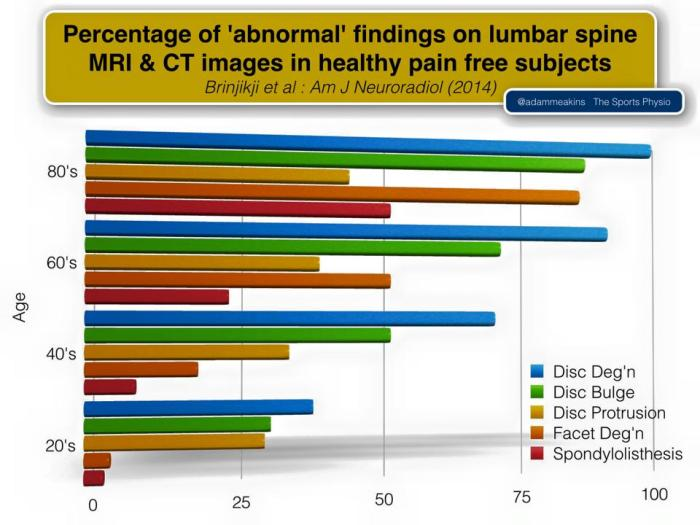 Researchers, Brinjikiji and colleagues, reviewed all available imaging studies and found by way of example that in pain free 50 year olds, 60% had lumbar disc bulges. That’s nearly two thirds of healthy, pain free, 50 year olds having signs of degenerative change. The research suggests that degenerative changes are common in asymptomatic individuals and that they increase normally with age. These findings suggest that many degenerative features that are sighted on imaging may be part of normal aging and are unassociated with low back pain, especially when incidentally seen. The graph above, courtesy of Adam Meakins - The Sports Physio, shows five of the most common spinal degenerative conditions and the frequency of which they were found in people who were painfree over the decades of life.